The Coinflip games are the simplest of the Skin Gambling games. You flip a coin and either win if the coin hits your side / symbol or lose your bet if it hit the other side. 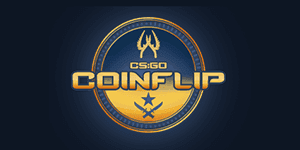 The coinflips games have been very popular in the skin betting scene, mostly because its so easy to understand and fast paced. Another important aspect of this game type, that few people probably know is that these coinflip games often offer the best odds of all the skin games. This is not always true though, which is why this site exists to guide you to the best CS:GO gambling sites. Another fun aspect of the coinflip game is that you get matched with a specific player and can see his avatar and in-game name. This opens the door for some taunting avatars and steam names which can be both fun and irritating. Excitement wise this game surely give you thrills. Maybe not as much as when you hit a big multiplier in the CS:GO Crash games and decide to keep going. But when the bets are big, the pulse surely rises. Maybe you hit that Karambit that you really want?